The saint bernard is a large heavy built breed of dog that was developed in 980 AD by monks who mixed multiple large dogs to create a seperate breed all of its own. 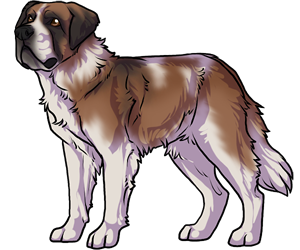 the saint bernard was to be used as a guard and working dog. its most common known method of works is avalanche rescue. these dogs worked in groups by locating bodies and keeping them warm while another ran back for help saving many lives. the saint bernard was reconized by the akc in 1885.
saint bernards originally had short hair to begin. eventually longer haired breeds were implemented into their lines. it is assumed that these dogs have the ability to predict avalanches and their occurances before humans can.